Pinewood Lodge sits on the ridge above the Inn and boasts 7 (seven) luxury efficiencies. Each of the units has a queen bed and a sleeper sofa that pulls out into a single bed. The contemporary but nature oriented décor makes each of the units comfortable living quarters, perfect for families and small groups. 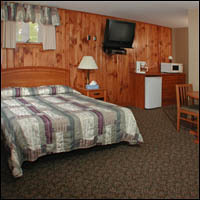 All units have coffee maker, microwave oven, small refrigerator, telephone service and television with satellite service. There are full baths in each room. 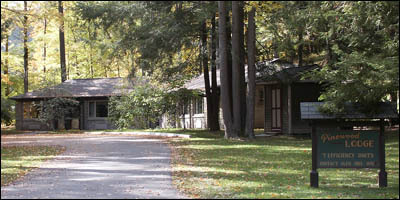 One lodge has been remodeled to be handicap equipped.